PlanetSide 2 creative director, Matt Higby, reveals that turning up the PC version to "Ultra" is how the game will look on PS4. PlayStation 4 players planning to pick up free-to-play shooter PlanetSide 2 will be pleased to know that it's going to look amazing on consoles. Speaking to GameZone, creative director Matt Higby reveals that if you "turn up" the game on PC to "Ultra," that's how it will look on the PS4. Higby also confirms that the DualShock 4's touchpad will be used to navigate the shooter's User Interface (UI) to make it more seamless and "PC-like." Unfortunately, Higby didn't confirm what resolution the Ultra-quality visuals on the PS4 will run at, which seems to be a big deal these days to shooter fans. 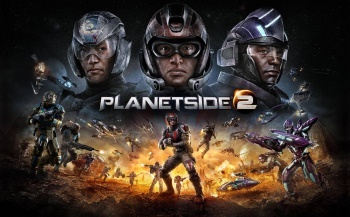 Developed by Sony Online Entertainment, PlanetSide 2 is a F2P MMOFPS released for PCs in 2012, and will make its way to the PS4 at a still unspecified date next year. For more on PlanetSide 2, it has also been confirmed back in August that PC and PS4 cross-platform play won't be possible due to the "update cadence."